Two weekends in a row, young 14 year old Will Schusterick has won A-Tier PDGA sanctioned tournaments. When he won the USDGC at just 9 years old in 2010, he wasn’t even a full time touring pro because he was still in elementary school. Now that he’s touring full time with his dad, Dave Feldberg, he has an expert, mentor, and life-coach he can lean on. OK, so while his “age” and “Feldberg relationship” were jokes, Schusterick IS a young buck and still under 21. 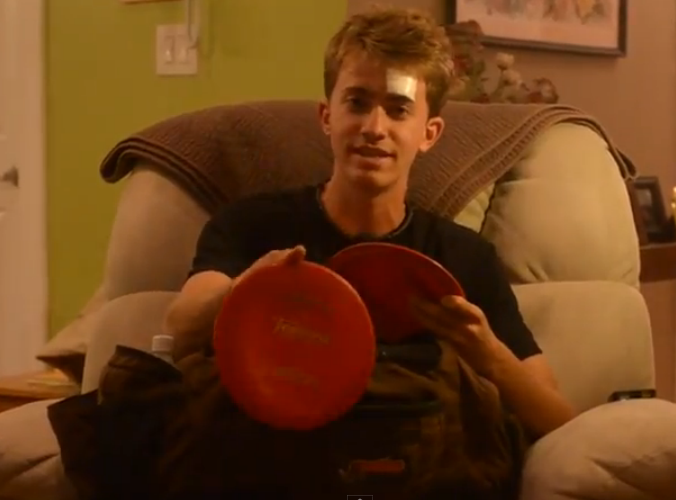 …and he IS touring with World Champ Dave Feldberg in the “Non-Stop-Disc-Golf” RV this Spring/Summer. Will is known as an excellent player, and is always a threat to win a given tournament. However, for Will Schusterick on the whole, he has yet to purely dominate a long stretch of time like some of his peers have managed to do (Nikko, Feldberg and Doss to name a few). This past pair of tournaments may have been just what Will needed to “turn the corner”- much in the same way Paul McBeth did in 2011 with his two NT victories. Schusterick just won the Glass Blown Open in Kansas two weekends ago (by 5 strokes) and moved right on to win the SOKY Championships in Kentucky last weekend (by 6 strokes). Playing well at a big tournament is important for the sake of confidence and experience, but simply playing well isn’t enough. A pair of back to back A-Tier victories from Schusterick shows us that he is learning how to win- not just play well. Will Schusterick throws plastic far. As all disc golfers hear and say: you need to play with better players if you want to get better. Something tells me the same holds true for hanging out and traveling. Now that the NSDG RV is rolling around the country, we can modify the advice to: “If you want to be a better disc golfer: tour the country with some of the best disc golfers out there.” I’m just wondering how I can get Barry Schultz, Ken Climo, and Avery Jenkins to fit into my wife’s Toyota Tercel… In all seriousness though, we’ve seen big wins from Cale Leiviska this year already, and now Will Schusterick is tearing things up. These four guys (Nikko Locastro, Dave Feldberg, Cale Leiviska and Will Schusterick) are spending a lot of time together driving around in the NSDG RV, organizing tournaments and leagues, playing in tournaments, and trying to be ambassadors of the sport of disc golf. Meanwhile, they’re winning. It might be as simple as motivation: if you’re living and breathing disc golf, and you’re seeing the guys who may or may not beat you 24 hours a day- you’re probably going to step up your game. At the very least, it’s leading to better results. The only question is whether Will Schusterick is going to let any of his travel buddies win again? If you’re not following the Non-Stop crew on Facebook or through their website– I recommend checking them out. If you’re not really into the social networking scene, you need to at least give their videos a watch on their YouTube channel. Most of their videos involve some kind of bonus clip, blooper, or at the very least a good laugh among friends. My personal favorite is watching Uli throw it about 90 degrees off target… It’s a good window into some good times! This entry was posted in Touring Pros and tagged 2012, disc, golf, non, shusterick, stop, tour, will, wins. Bookmark the permalink. Dave Feldberg is Will Schustericks father?!?!?! So Will is 14 years-old now but won the USDGC at age 9 and now Dave Feldberg is his Father?!?! I had no idea…. Will isn’t 14. O.o We graduated from the same high school together in 2010. I was joking with that comment as well and I totally get your form of sarcasm, I was just adding to it! !